Was bought for me as a gift but I don't really use it. So only been used a handful of times. Its basiclly 3 in one, Red and Black ballpoint with a pencil. Lovely pen and writes so nicely but I just don't use it. 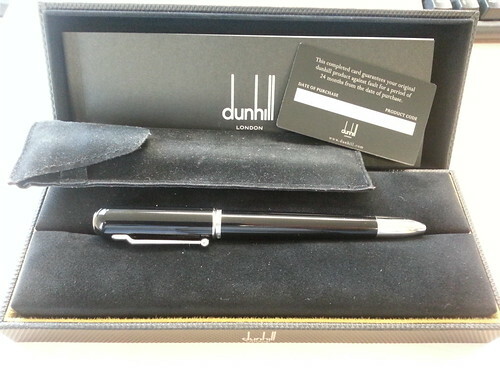 Comes with outer box, inner box (Dunhill branded), manual/card and velvet Dunhill pen case. These are over £400 so going to sell for £300 including postage RMSD. Thats a nice piece of kit, lovely. Not for me though, ink pen only these days - helps hide my terrible writing! Hi, I realise this is a long shot - but is this pen still for sale by any chance? Wow six years on, that is a LONG lead time for a sale.